Google is tracking you to give you better results. The problem with advancements in technology is the fact that the users’ privacy has a tendency to get in the way. Google launched Personalized Search on Tuesday and it now tracks where you go in order to give you better results in the future. Of course, in order for Google to track someone, they must have a Google account and be logged in. So if you don’t want Google following you, don’t log in any Google services before searching. Though a partnership with Kanoodle, TypePad pro users can now take advantage of text-based advertising on their blogs. This feature can not only earn you extra cash, but can also pay for your TypePad fees. You can set up the ads one of two ways. Easy or Customized. Easy does everything for you while customized allows you to configure fonts and colors. 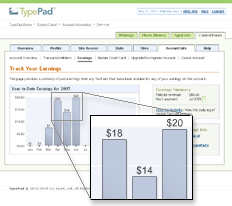 TypePad also gives tools for tracking earnings so you can view daily ad impressions and ad clicks. As the conference progresses, links will be added to this page. Fresh content is a distinct advantage for your search engine placement and for your site visitors. Repeat traffic from people and search engine spiders will increase proportionate to how fresh your content is. Producing fresh content takes time and resources. Tools like RSS Mix can help by automating a part of your content development. RSS Mix allows you to combine any number of RSS feeds into one unique new feed. You can then use a parser to display a mix of stories from various sources on your website. Tim Mayer has announced on the Yahoo Search Blog that there will be a major update to it’s index this evening. Per a request from Danny Sullivan at Search Engine Strategies in San Jose last summer, Yahoo has started issuing “weather reports” of updates to its search engine. Alas, I am unable to attend the two conferences I’ve been looking forward to for months: WebmasterWorld Search Conference in New Orleans starting today and Chris Pirillo’s sold out Gnomedex June 23-25 in Seattle. I had to go and turn 40 this week and my dear wife is taking me to some exotic locale (I don’t know where yet, it’s a surprise) for a week. Posting from me will be light, but Thomas will be posting daily on search engine marketing news and insights. Be sure to watch for RustyBrick’s coverage each day of the New Orleans WebmasterWorld conference. Via iMediaConnection, eMarketer has published an excellent article on BtoB buyer’s search behavior and future trends for BtoB search marketing. I just noticed an interview I did with a Minneapolis Star Tribune reporter on Yahoo 360 was published today, “Yahoo spreads its net on the Web “. At best I thought I’d get one little quote. He used at least three plus a mention of my SEO firm, TopRank Online Marketing. I guess everyone gets lucky once in a while. The article touches on what Yahoo is doing with Yahoo 360 and also Microsoft’s Wallop. Here’s a post on Online Marketing Blog/2005/06/whats-up-with-microsoft-wallop.html”>Microsoft Wallop from earlier this month. Incidentally, if you are interested in a Yahoo 360 or Wallop invite, post a comment. Here’s a cool keyword research tool I discovered when looking at this site’s referrer logs. NicheBOT offers keyword research options including: WordTracker Keywords, Overture Keywords, Thesaurus, Lateralus, Keyword Analysis and Google Ranking.